Nick wearing an exclusive Nick Fouquet x The Rake bash fedora. Is there a hat for everyone? It’s one of life’s great mysteries. If walking around London has taught me anything, it is that the majority of commuters have given up on the search, left the question unanswered. Long gone are the days when city dress, or a commission in a household regiment, insisted on a bowler hat, or when a hat was as common or garden a part of outdoor attire as an overcoat. Even having spoken to the world’s august hatters, I was adamant that I do not suit hats. As much as I love pictures of Anthony Eden in his homburg, or Humphrey Bogart in his trilby, that magical binary existence between hat and head never seemed to translate to yours truly. I am nothing, however, if not stubborn, and I long for the day when I can leave the house and clip-clop down the street full of beans, and with a sense of swagger, because of my hat. Well, could it be that my time has come, the wait is over, and I can ascend to the lofty heights of the well-hatted? My saviour apparent is Nick Fouquet. Our man in Los Angeles has got to know The Rake well over the years, appreciating that our values — of understanding the rules of classic elegance, and how to break them — are so well aligned with his that when we suggested we team up to produce a hat that would be available (in a limited amount) for The Rake Atelier, he got to work. Nick isn’t what you’d call a traditional hatter. His designs are created with idiosyncrasy in mind, with fantastical names like The Creek Rider and The Tobacco Thief, which inject an element of drama and narrative — soul, if you will. While they are all made for the practical purpose of wearing, there is equal justification for mounting them on your wall as part of your art collection. This ingenuity has been the making of Nick as a hatmaker, and explains the breadth and depth of his client base, which includes LeBron James and David Beckham. The dark brown bow is made of velvet and is a hat-doff to The Rake’s classic style tradition, which in this instance refers to black tie, accentuated by the French grosgrain band. The rich grey colour of the felt pronounces the formality but is versatile enough for any outfit. This is perfectly exhibited with the images of Nick shot by the great Robert Spangle in the Los Angeles sunshine; I can also vouch for it, having worn it on a cold, rainy London day with a suit and grey overcoat. The feather is, of course, a nod to the ‘stuck-a-feather-in-his-hat’ tradition of the dandy, but the positioning and inclusion of the feather is optional; you can either have it threaded into the bow or on the brim. There will be only 12 of these made; no more, no less. Each hat will be stamped with a number between (you guessed it) one and 12 and split between four hats per size. The joy of working with Nick is that his laid-back, Venice-Beach, devil-may-care demeanour belies the fact his product is among the most coveted in the world. His global capsule collections sell out, despite the high price point. The perception of hats as an accessory is turned on its head by Nick’s designs, as the buyer will try to work an outfit around it, not the other way around. So we are certain of their commercial viability as much as we are their aesthetic and stylistic prowess. It is with genuine enthusiasm that I write about the arrival of this hat. Nick’s creations don’t just tell a story, they also give permission for people to feel like there is a hat to which they can belong. 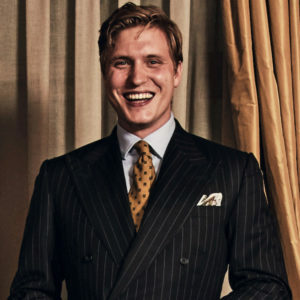 It is an effect similar to that of bespoke suiting: when risks are taken with fabric choices, lapel sizes, button positioning, cut, colour and check, you can feel elevated and emboldened. It is a remarkably rewarding pursuit, and the hyperactivity and anxiety involved turns to what (supposedly) Ralph Waldo Emerson referred to as the “tranquillity” that comes with being well dressed, a tranquillity that “no religion can bestow”. 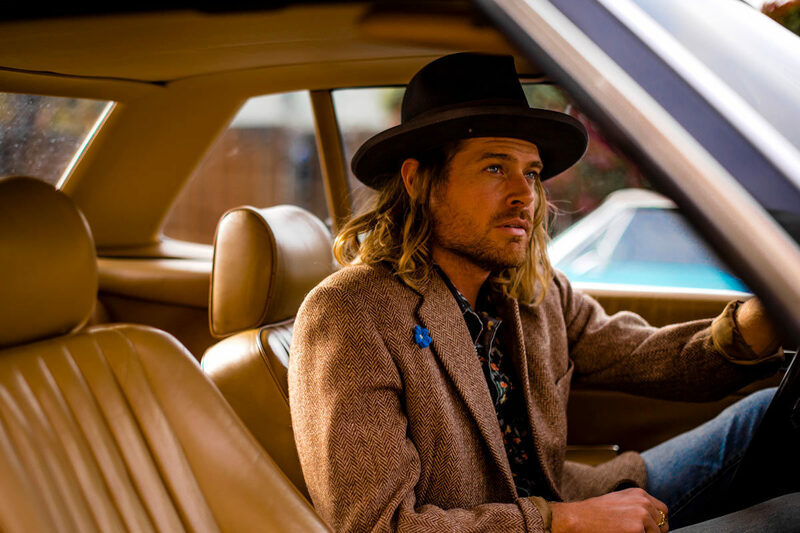 Nick Fouquet provides the answer to the unanswered question, Is there really a hat for everyone? Yes — and we at The Rake are proud conduits and partners.